You may cancel an item or order that has not shipped out of our warehouse by contacting us. Unfortunately, once the item or order has been shipped, we cannot cancel it. Please visit the Return Policy page for more information. Most of the items that we carry are fully assembled. For items that require assembly, you will receive assembly instructions with your package. We are only required to charge sales tax in the state of California and New Jersey. The rate varies based on the delivery destination. Colorado purchasers: Sales or Use Tax is due on certain purchases and the state of Colorado may require you to file a Sales or Use Tax Return. We do not ship to Canada and/or overseas at this time. To check the status of your order, sign in to My Account. Click on Order History to view your previous orders. Please allow 24-hours for status to become available after the order is placed. We have all of our instructions manuals on the Assembly Instructions page. You can download the manual as a PDF file. If you do not see your item, please contact us and we will email you a PDF copy. Payments are required at the time of purchase. We accept all major credit cards, Payal, and Google checkout. Orders submitted with incorrect billing information will need to be verified and shipment will be delayed. For security and authentication purposes, the billing address provided with your order must match the billing address associated with the credit card being used to make the purchase. Shipping by FedEx Ground takes 4-7 business days. Shipping by Truck Freight takes 7-10 business days. For detailed information, Please visit the Shipping Information page. The Dream Furniture website is best viewed with Internet Explorer or Firefox, along with a screen resolution of 1024 x 768. If you are having difficulties, you may need to update your browser. If you feel you have received the wrong item, please contact us within 72 hours of receiving the item. Dream Furniture uses Secure Sockets Layer (SSL) technology. Information is sent in an encrypted format that only Dream Furniture can read. Users will see Comodo lock icon that assures they are interacting on a secured domain. 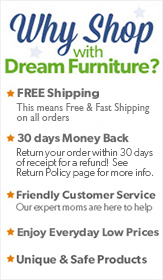 In addition, Dream Furniture does not store credit card information. Please identify which part is missing in the instruction manual included with your item. Contact us with this information and the shipping address you need the part sent to. Sign in to My Account to view your order status. Be sure that all of the items in your order have been shipped. If your order has a tracking number, check with the shipper to confirm the delivery status. If the order status shows "delivered" and you have not received your items please contact us. Your credit card will be charged the moment your order ships. An estimated availability date will be provided for out-of-stock items that are in-transit to our warehouse. If there is no date provided, please check back with us soon. Backordered items are items that are currently out-of-stock but are expected to arrive within 60 days. We will ship the item out to you as soon as it arrives.